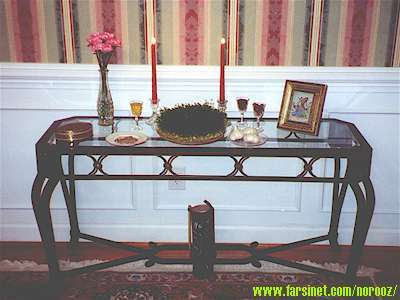 A major part of the New Year rituals is setting a special table with seven specific items present, Haft Sin (Haft chin, seven crops before Islam). In the ancient times each of the items corresponded to one of the seven creations and the seven holy immortals protecting them. Today they are changed and modified but some have kept their symbolism. All the seven items start with the letter "S"; this was not the order in ancient times. Zoroastrians today do not have the seven "S" but they have the ritual of growing seven seeds. The ancient Iranians also grew seven seeds as a reminder that this is the seventh feast of the creation, while their sprouting into new growth symbolized the festival's other aspect as a feast of resurrection and of eternal life to come. Wheat or lentil representing new growth is grown in a flat dish a few days before the New Year and is called Sabzeh (meaning green shoots). Decorated with colorful ribbons it is kept till the last day and will be disposed off on Sizdeh be dar, the 13th day while outdoors. A few live gold fish (the most easily obtainable animal) are placed in a fish bowl. In the old days they would be returned to the riverbanks, but today most people will keep them till they die. Mirrors are placed on the spread with lit candles as a symbol of fire. Zoroastrians today place the lit candle in front of the mirror to increase the reflection of the light. Mirrors were significant items in Zoroastrian symbolism art and architecture, and still are an integral part of most Iranian celebrations including marriage ceremony. They are used extensively in Iranian mystical literature as well and represent self-reflection. All Iranian burial shrines are still extensively decorated with mirrors, a popular decorative style of the ancient times. Light is regarded as sacred by the Zoroastrians and the use of mirrors multiplies the reflection of the light. Wine was always present. Since the Muslim conquest it has been replaced by vinegar since alcohol is banned in Islam. Egg a universal symbol of fertility corresponding to the mother earth, Sepanta Armaiti is still present. The eggs are hard-boiled and traditionally are colored in red, green or yellow, colors favored by Zoroastrians. Recently following the Easter Egg tradition, any color is used and they are elaborately decorated. The eggs are offered to children as treats. Fresh garlic is used to warn off bad omen. This is a modern introduction. There is no evidence that it was used in this context before.